Before you get all huffy that this is a Christmas post at the beginning of November, think of it this way: if you win this contest, then you'll have your item of choice to use during the Christmas season instead of having to store it away for a whole 'nother year. (Of course, you are welcome to store it anyway, but sometimes its fun to use something immediately upon receipt.) Anyway, with that in mind, let us proceed. Last week I received a very fun box in the mail with some Christmasy items from Peter Pauper Press. I'll tell you a little about each one and then down below you can enter for a chance to win the item of your choice. 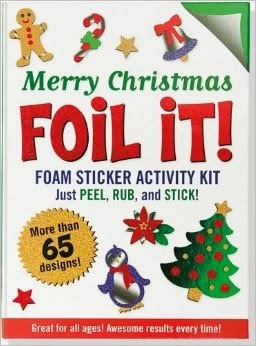 First up, there is Merry Christmas Foil It! I figured that this one would be super popular with my sticker-loving daughter. I was correct in this assumption. Not only did she enjoy it, but her brothers did also. Contrary to what you might think by looking at the box, this kit is remarkably mess-free. I am NOT a crafty person (as I've mentioned before) and gratefully I don't have to be in order to make really cool stickers that impress my children. In this kit you'll receive four sheets of foam stickers which you punch out from the sheets. Each side of the foam is coated with a sticky adhesive. You peel off one side and then place the sticky foam onto provided pieces of shiny foil. Rub the foil with your fingers and when you peel the sticker off, you will see that it has applied foil to your sticker. Make shiny Christmas trees, presents, snowflakes, penguins and more. Very cute and clever idea. Bonus: again, it doesn't require crafting skills and it is a stress-free happy activity. It does not create a gigantic or huge mess. The box says that this activity is great for all ages and I would agree with that. My two year old was able to make a sticker all by herself. Next we checked out Ready, Set, Draw . . . Christmas! The title is rather self-explanatory. This is a hardback, heavy duty style of "learn to draw" book. 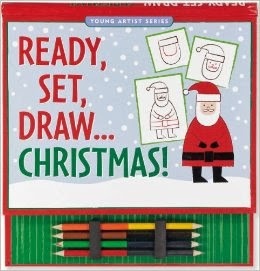 Each page spread teaches you how to draw a different familiar Christmas image. The instructions themselves are spiral bound into this book which keeps the pages conveniently flat. Learn how to draw Santa, Santa's sleigh, a poinsettia, a holly leaf, a snowflake and several other things as well. You receive four double-sided colored pencils (8 colors total) as well as a 48-page sketch pad. The pencils can be slid into a pencil holder (pictured) that is attached to the "book" making this an easy-to-contain activity as well. Again, you don't have to be crafty to use this one (hurray!) but it does foster creativity. My second born is interested in learning to copy pictures lately and I think this book is perfectly suited for him. He is a soon-to-be five year old. I would say that this book is fantastic for any kid who has the motor skills to start copying simple pictures. Despite what I have just confessed, I want to hastily say that these paper craft figures are cooler than cool. However, they are best put together by hands that are able to do a bit more detailed work, are not quick to crush things and are patient enough to wait for glue to dry. My youngest is two and my oldest is seven. My seven year old really likes the concept of these, but he was frustrated a bit by them as well. 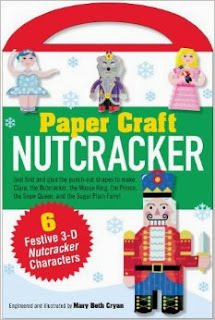 This kit is awesome for detail-lovin' crafty kids (or very involved, crafty parents). Really neat. Really cute. They might suit your family very well but they do not fit ours as nicely. Now, this last one I figured for Bookworm1 and I was excited about handing it over to him to see what he thought. Sure enough, his reaction did not disappoint. 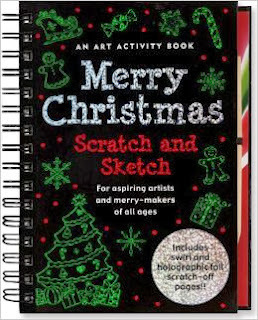 Merry Christmas Scratch and Sketch is a book filled with black pages and a wooden stylus (with no ink). "Here," I said, "draw something." He took the book, pulled out the wooden stylus and looked at it. "But there isn't any ink!! How am I supposed to draw?!" I encouraged him to try. He looked very confused as he marked the page and a sparkling red line appeared! This book is filled with blank black coated pages. Use the stylus to scratch away a design of your own, creating stockings, snowmen, snowflakes or whatever you like! Bookworm1 was very, very impressed with this title. He declared it to be "super cool!" and I think that sums this book up. It is super cool! Surprise your kids and let them be creative on some pretty unique drawing paper. We've had a blast with this one (with even Mommy and Daddy hopping in on the action and testing the pages out). Very fun stuff. 2. The title of the item you would (most) like to win. This contest is open to US residents only and will be open through Tuesday, November 12th. THIS CONTEST IS NOW CLOSED! THE WINNER, as selected by Random.org IS #6 - Apple Blossom. Congrats! Many thanks to Peter Pauper Press who send the above items my direction in order to facilitate this review. I receive no additional compensation for this post and all opinions are 100% my very own. My thought when I saw your Christmas post; "SQUEE! ", I LOVE Christmastime! I love all of these. The Scratch and Sketch or Ready, Set, Draw...Christmas would probably be the biggest hits for my crew. Thanks for this supercool giveaway! I think you are quite right to have a Christmas giveaway now. And Duchess would LOVE the nutcracker book. I'm getting excited already for the holiday season. I think my eldest son would enjoy the Scratch & Sketch. Thanks! I would love to win the Merry Christmas Scratch and Sketch book most of all. I love them all though! Thanks for the giveaway! I♡Christmas too. :) These look fun! I think my kids would love the scratch and sketch. Really awesome books-I would choose the Merry Christmas Foil It! book. I think the Foil it one sounds perfect for Firefly!